A few years ago, I wrote a story about the benefits of a vegan diet. I interviewed Neil Barnard, M.D., founder of the Physicians Committee for Responsible Medicine and considered by many to be the “peaceful warrior” of the vegan movement. “So what’s keeping you from going vegan?” he asked. “I love cheese,” I admitted. “I can’t imagine giving it up for good.” I didn’t mention that vegan cheese was unlikely to cut it for me. Now, this isn’t just the claim of a guy who espouses a plant-based diet. Barnard is a solid researcher, and it turns out cheese (along with other foods) may exert an opiate-like affect on the brain. You eat more, so you crave more. If cheese is an occasional treat enjoyed in moderation, it’s not so bad. But as Barnard explained, America’s cheese consumption surpassed moderation long ago. It has blossomed into a national addiction encouraged by the USDA through such initiatives as Dairy Management, an industry- and government-funded marketing initiative to promote cheese. As a result, Americans’ cheese consumption has skyrocketed to three times what it was in 1970, up from 8 pounds per person per year then to 24 pounds per person, per year now. The numbers are even more dramatic when you consider that your grand-grandparents were nibbling an average of just 4 pounds of cheese a year in 1909. The really sad part? Most what we’re eating today is cheap cheese — plastic-like, mass-produced junk stuffed into fast-food fare. Do we really need pizza crust stuffed with cheese because the pound of cheese on top isn’t enough? And although I still love cheese, I really don’t need to eat 2 pounds of it a month. I’d like to cut back and save my cheese “budget” for the good stuff. Well … not quite. Until recently, my brush with vegan cheese has been disappointing — odd tastes, odder textures, the best akin to Velveeta. But lately I’ve noticed an interesting trend: Vegan cheesemaking, like vegan baking, is going uptown, with chefs using nuanced ingredients and traditional cheesemaking techniques — plus some new techniques — to create great results using plant-based ingredients. 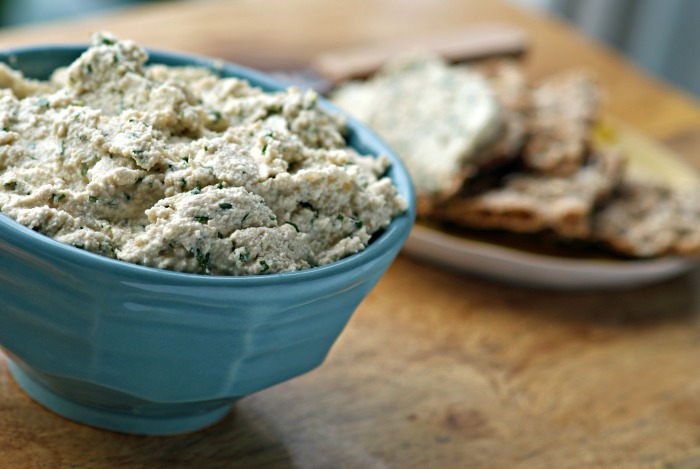 This soft, nut-based vegan cheese from Tess Masters’ new book, The Blender Girl: Super-Easy, Super-Healthy Meals, Snacks, Desserts and Drinks (Ten Speed Press) is a good intro to the world of plant-based cheese. The soaked nuts give it creamy heft, while the addition of white miso paste and tamari lend it a cheese-like hit of umami. Truth is, I love the stuff. Does it mean I’ll never nibble a Dutch Gouda or a French bleu again? Probably not. But for everyday satisfaction, this will do. 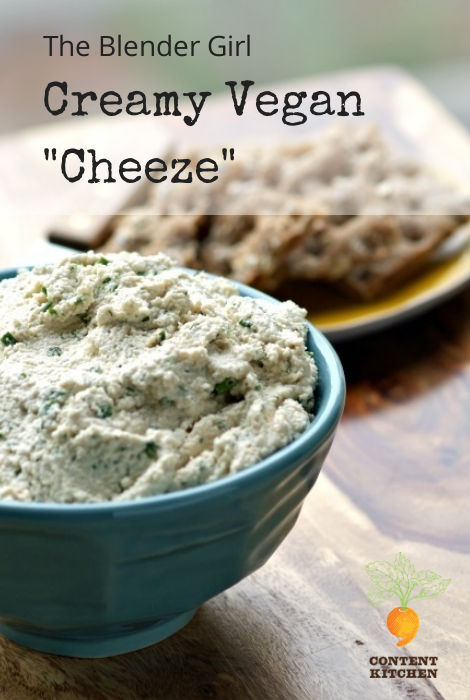 The Blender Girl's Basic Creamy Vegan "Cheeze"
This is a dead-simple recipe -- most of the time needed is just to allow the nuts and seeds to soak and soften up. This vegan "cheese" definitely has a creamy texture, and it does firm up a bit as it chills in the fridge. If you like a firmer cheese (I do), you can scoop it into several layers of cheesecloth and tie it up with kitchen twine. Then secure the bundle to a wooden spoon with more kitchen twine, balance it over a large bowl or measuring cup, chill, and let it drain for 4-8 hours. Place the almonds, pine nuts and sunflower seeds in a large bowl. Cover with 1 quart warm water, and stir in 1 teaspoon lemon juice and 1/2 teaspoon salt. Cover with a thin dish towel and let stand overnight at room temperature. Pour the milk, oil and remaining 3 tablespoons lemon juice in a blender or food processor. Drain the nuts and seeds, discarding the soaking liquid. Add the nuts and seeds to the blender, along with the miso paste, tamari, garlic and 1/2 teaspoon salt. Puree on high for 1-2 minutes, until well combined and creamy (it won't be perfectly smooth). You may need to stop the machine now and then to scrape down the sides of the container with a spatula. Scrape the cheese into a bowl; stir in the herbs, if using. Add more salt as needed. Chill in the refrigerator for 1 hour to allow the cheese to firm up a little. Adapted from The Blender Girl by Tess Masters.